The original specimen of Ornithocheirus simus, from Joseph Dinkel. The pterosaurs of the Ornithocheiridae that lived between the Early and mid-Cretaceous were not the largest pterosaurs to ever live, but with a possible maximum known wingspan of about 7 m (Martill & Unwin 2011) they were certainly big enough (for comparison, an Australian pelican has a wingspan of about 2.5 metres). Ornithocheirids have been recorded from numerous parts of the world—Europe, South America, Africa and China—and, like the large seabirds that are perhaps their closest modern analogues (where 'closest' is a relative term), were probably found worldwide. Reconstruction of Ornithocheirus mesembrinus, by Dmitry Bogdanov. The 'misunderstood' in the title to this post refers specifically to the type genus, Ornithocheirus, which has suffered something of an identity crisis over the years. In the 1800s, 'Ornithocheirus' was used as a catch-all genus for almost all Cretaceous European pterosaurs, many known from only fragmentary remains. Eventually, the name came to be associated with a number of species centred around the British O. compressirostris. However, Unwin (2001) pointed out that, at its earliest publication, only one valid species was associated with Ornithocheirus, O. simus, and that species automatically becomes the type of the genus. Ornithocheirus simus is not currently regarded as congeneric with 'O.' compressirostris (and had for many years been treated under the name of Criorhynchus, e.g. Wellnhofer 1991), and so most species previously treated as Ornithocheirus are now treated as a genus Lonchodectes, and not ornithocheirids. Just to confuse matters further, however, some recent authors have continued to treat Ornithocheirus as typified by O. compressirostris, and refer to the 'Ornithocheiridae' of Unwin (2001) as the 'Anhangueridae'. On the other hand, some recent phylogenies have even suggested that Lonchodectes may itself be related to the Ornithocheiridae (e.g. Andres & Ji 2008). Reconstruction of Coloborhynchus piscator, by Joseph Conway. Ornithocheirus simus was originally described from a piece of the front of the rostrum found in the Cambridge Greensand of England. 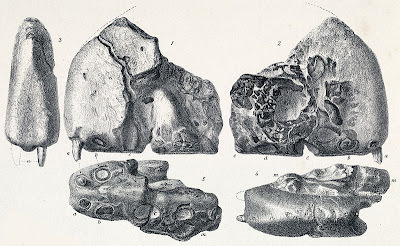 This piece was notably deep, and so O. simus was reconstructed as having a short, deep puffin-like skull. 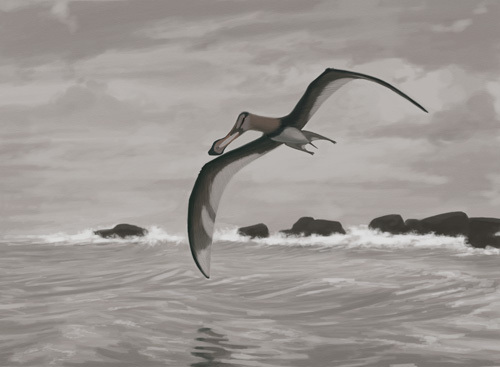 It wasn't until the later discovery of a more complete skull in a closely-related South American species, Ornithocheirus mesembrinus (alternatively known as Tropeognathus mesembrinus), that a more accurate reconstruction was possible: Ornithocheirus species had a long rostrum, similar to that found in related pterosaurs, but with prominent rounded dorsal and ventral crests at the distal end. Species of another ornithocheirid genus, Anhanguera (also known from England and South America), had rostral crests set further back and differently shaped. These crests most likely served some form of display function; suggestions that they may have aided in the capture of fish on the wing by easing the rostrum's passage through the water (Wellnhofer 1991) seem unlikely, as other ornithocheirid genera, such as Brasileodactylus and Barbosania, lacked rostral crests entirely (Elgin & Frey 2011). The possibility has been raised that some crested and crestless forms may represent different sexes of the same species, but unfortunately the fossil record of ornithocheirids may not be extensive enough to establish whether this is the case. The skull of Ludodactylus piscator, via Darren Naish. 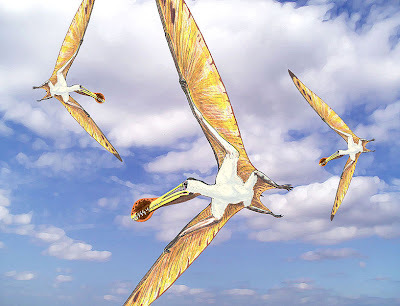 The phylogeny of pterosaurs remains a contentious issue but most studies have agreed that ornithocheirids form part of a clade that also includes the Istiodactylidae, Pteranodontidae and Nyctosaurus (though how exactly these taxa are interrelated has not been agreed upon). Ornithocheirids are distinguished from related forms by the arrangement of their teeth, with the first three pairs enlarged to form a terminal rosette. Most ornithocheirids are also distinguished from Pteranodontidae and Nyctosaurus by the absence of a crest on the back of the head. A noteworthy exception is Ludodactylus sibbicki, described by Frey et al. (2003) from a skull possessing a crest at least basally like that of Pteranodon (the skull is preserved on a slab of rock prepared commercially, and the distal portion of the crest [if it had been present] was removed when the slab was cut). However, it is worth noting that Ludodactylus has not (to my knowledge) been included in a formal phylogenetic analysis. Ludodactylus was identified as an ornithocheirid due to its tooth morphology, but the absence of teeth in Pteranodontidae and Nyctosaurus makes them incomparable in this regard. As the Istiodactylidae (with their broad, duck-like rostra) are also reasonably autapomorphic in their skull morphology, I can't help wondering whether the supposed ornithocheirid characters might be plesiomorphic for the larger pteranodontoid clade. But that, of course, is pure speculation on my part, and something only further study could establish. Andres, B., & Ji Q. 2008. A new pterosaur from the Liaoning Province of China, the phylogeny of the Pterodactyloidea, and convergence in their cervical vertebrae. Palaeontology 51 (2): 453-469. Elgin, R. A., & E. Frey. 2011. A new ornithocheirid, Barbosania gracilirostris gen. et sp. nov. (Pterosauria, Pterodactyloidea) from the Santana Formation (Cretaceous) of NE Brazil. Swiss Journal of Palaeontology 130: 259-275. Frey, E., D. M. Martill & M.-C. Buchy. 2003. A new crested ornithocheirid from the Lower Cretaceous of northeastern Brazil and the unusual death of an unusual pterosaur. 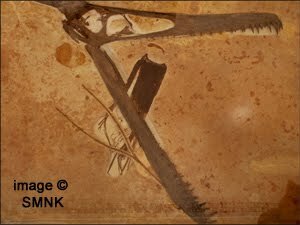 In Evolution and Palaeobiology of Pterosaurs (E. Buffetaut & J.-M. Mazin, eds) Geological Society Special Publications 217: 55-63. The Geological Society: London. Martill, D. M., & D. M. Unwin. 2011. The world’s largest toothed pterosaur, NHMUK R481, an incomplete rostrum of Coloborhynchus capito (Seeley, 1870) from the Cambridge Greensand of England. Cretaceous Research 34: 1-9. Unwin, D. M. 2001. An overview of the pterosaur assemblage from the Cambridge Greensand (Cretaceous) of Eastern England. Mitt. Mus. Nat.kd. Berl., Geowiss. Reihe 4: 189-221. Wellnhofer, P. 1991. The Illustrated Encyclopedia of Pterosaurs. Salamander Books: London (reprinted 2000, in The Illustrated Encyclopedia of Dinosaurs (D. Norman & P. Wellnhofer). Salamander Books). Nice review of some horribly complex taxonomy and systematics. Pterosaur work has suffered for years with all the problems surrounding the ornithocheirids. Incidentally, Ludodactylus has been put in one analysis (Lu et al. 's paper on Darwinopterus) and it comes out unsurprisingly as sister-taxon to a polytomy of Ornithocheirus, Anhanguera and Coloborhynchus. I've seen enormous wingspans claimed for Ornithocheirus (the Swedish Wikipedia says 12m, frex). Is this just exaggeration of the same kind that gave us 25m Liopleurodon, or has ideas on wing shape or something changed? Or does it belong to Lonchodectes? And if so is it accurate for that genus? The Martill & Unwin (2011) paper that I cited refers to 'popular myth' about the maximum size of ornithocheirids, but doesn't cite a source for said misconception. I'm guessing that it may be exaggeration, it may be due to confusion between ornithocheiroid and azhdarchoid remains, or it may be due to over-enthusiastic extrapolation from the fact that most well-preserved ornithocheirid specimens are not fully mature. It's worth also noting at this point that the 7 m estimate is not based on well-preserved remains; it's based on a rostral fragment, and the potential wingspan was estimated by comparing the size of that piece to the rostrum of smaller but better preserved individuals. Thanks for the update, Dave. I see that they did recover a monophyletic Ornithocheiridae excluding the toothless species. I had been concerned that Ludodactylus might not be amenable to phylogenetic analysis due to the way it had passed through the taphonomic steamroller.